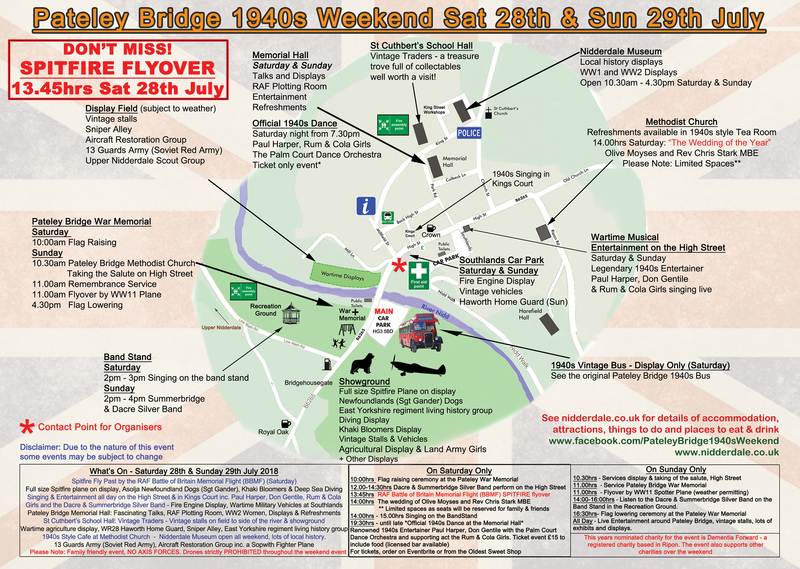 The next Pateley Bridge 1940′s Weekend is to be held on Saturday 28th & Sunday 29th July 2018! **Don’t Miss** 13.45hrs Saturday 28th July, a Spitfire from the Royal Air Force Battle of Britain Memorial Flight (BBMF) will be flying past! 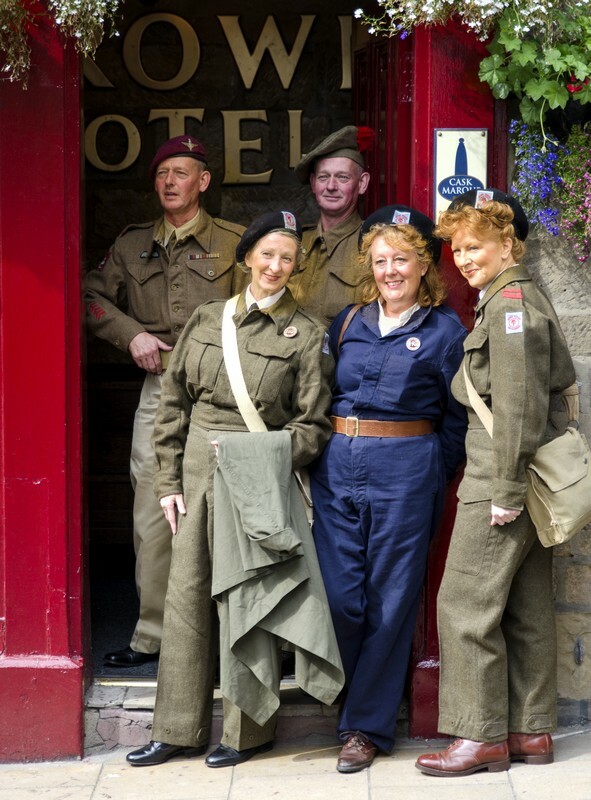 Pateley Bridge winds back the clock across the whole area taking you right back to 1940s and war time period. 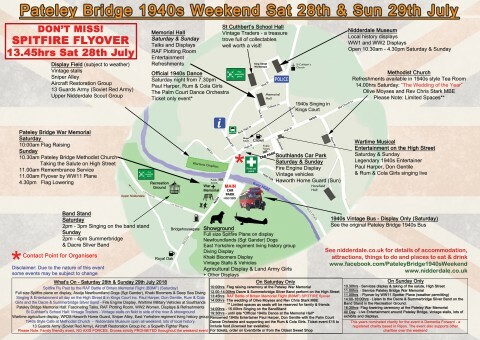 This fun 1940s themed weekend has lots going on for young and old alike in Pateley Bridge, this being the capital of Nidderdale set in the Yorkshire Dales and a designated Area of Outstanding Natural Beauty. 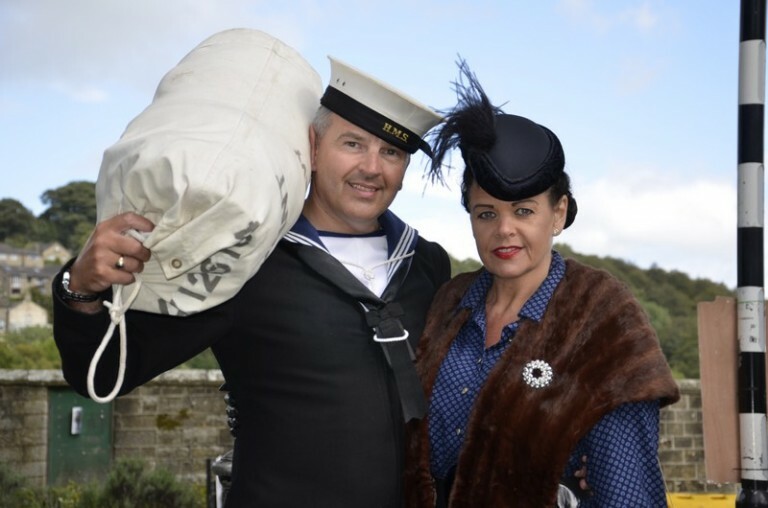 Lots to see and do with an opportunity to dress up in stylish 1940s clothes and learn about history during the wartime period! Go back in time with 1940s songs being sung live on the streets,the Summerbridge and Dacre Silver Band will also be playing in the town. Visit either outside stallholders or ones in the School Hall to view collectable and vintage items which are for sale. There is dancing, a fly over by a WW2 spotter plane and the chance to be photographed with a full size Spitfire plane! 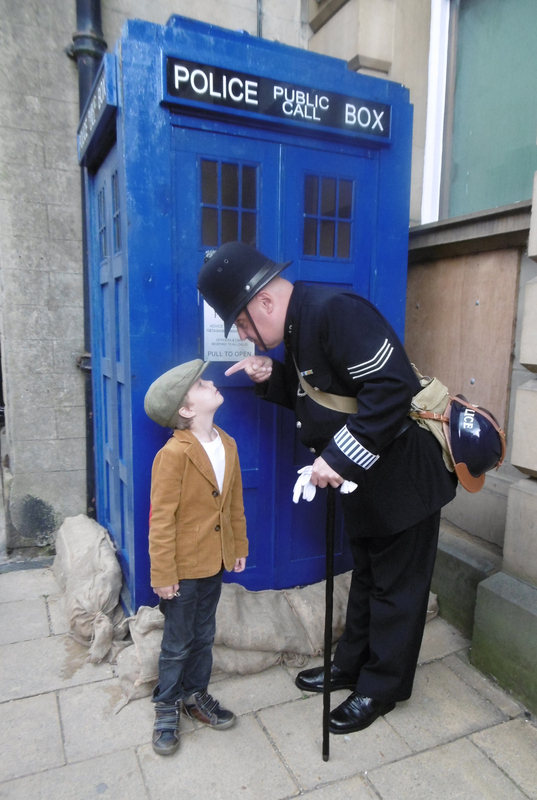 Look out for the policeman keeping an eye out for spivs and the local Homeguard who will be patrolling the streets. There are the Newfoundland Dogs who were used to rescue WW2 sailors from the sea. Come the evening, there will be a dance in the Memorial Hall with renowned 1940s entertainer Paul Harper supported by the Palm Court Dance Orchestra. 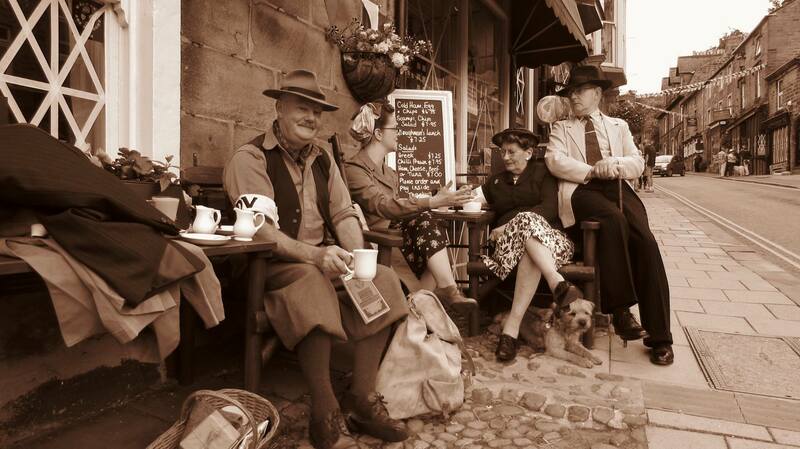 The many pubs will evoke memories with music and lots of fun associated with the 1940s. An action packed weekend with something for everyone! Check out the listings of events below. This is an event you should not miss!!! Admission to the event is free! 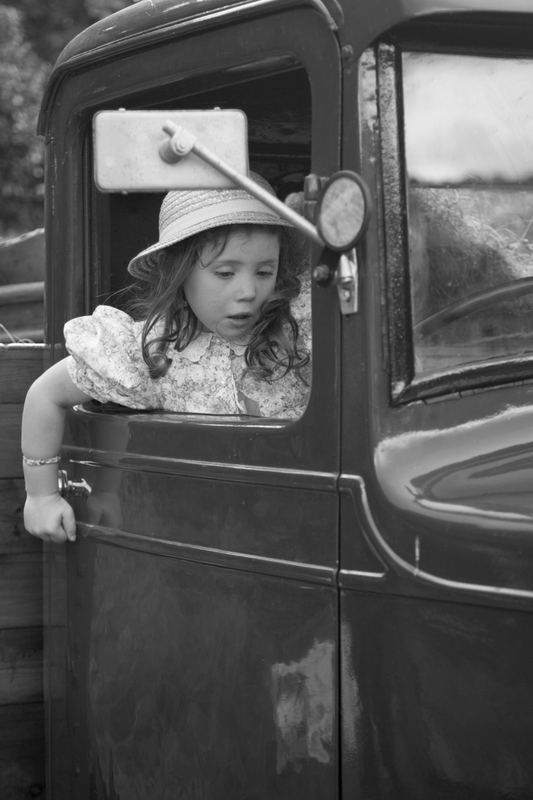 Ample all day car parking for the event is available on the Nidderdale Showground. Located near Harrogate in North Yorkshire, just type postcode HG3 5BD into your sat nav where you will be taken to the centre of the town. Event parking is located at the Nidderdale Showground (near the bridge). There are regular buses to Pateley Bridge from Harrogate on Saturday and Sunday, and on Sunday there are also buses from Keighley, Otley, Selby, York, Ripon and Upper Nidderdale. For times please visit the DalesBus website: www.dalesbus.org/nidderdale. There are many places to eat and drink in Pateley Bridge during the day and evening! For locally sourced quality food and drink, why not visit our charming cafes and pubs. Buy high quality pies from one of our award winning High Street butchers – you have a choice of two! Visit the bakery next to the petrol station where you will get bacon butties, or freshly made sandwiches and bread. Pateley Bridge in Nidderdale has a large and varied selection of types of accommodation including caravan parks with camping, pubs with accommodation, holiday cottages, hotels and B&Bs. There are many beautiful areas to stay in and around Nidderdale including Gouthwaite, Ramsgill Lofthouse, Darley and Fellbeck. Please see Accommodation for more details. For all enquiries contacted with the event, contact either Tim at Sypeland Outdoors on 01423 712922 or Keith at the Oldest Sweet Shop on 07552769000. Royal British Legion, Yorkshire Air Ambulance, Marie Curie, Save the Children, St Michaels Hospice, Manorlands Hospice, Escape Line Memorial Society, Yorkshire Cancer Research .